Westminster Village Center Zoning Bylaw - Community Opportunities Group, Inc. The Town of Westminster has obtained the services of Community Opportunities Group to create a new Village Center Zoning district. 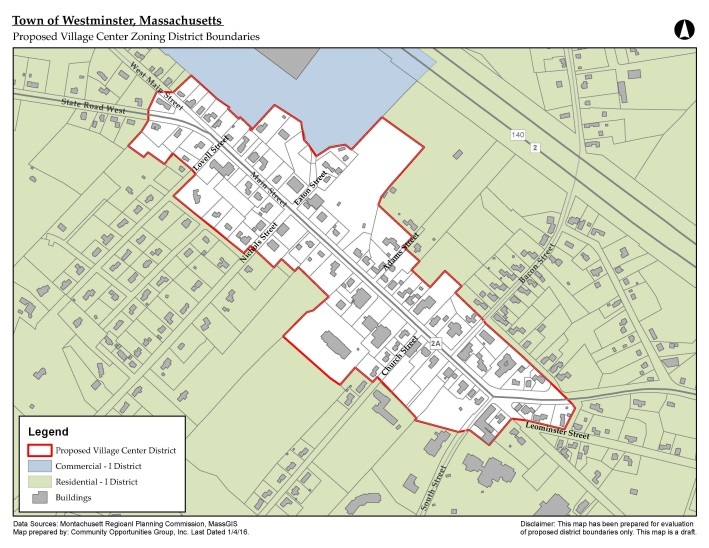 The purpose of the district is to bring all parcels within the Village Center under a single district, expand housing opportunities, and establish design standards to guide future development within the district to ensure that it is complementary with the traditional New England aesthetic befitting of their historic buildings and development patterns. COG worked with the Town to identify the boundaries of the new district and created an updated Zoning Map and performed public outreach to maximize the potential success for passage. The bylaw was passed nearly unanimously at the 2016 Annual Town Meeting.